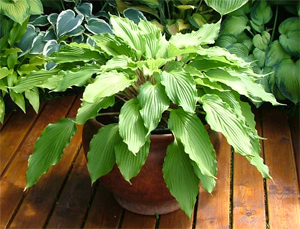 The main issue with growing plants in containers is their need for regular watering. Using shallow dishes or trays filled with water, to stand your pots in, takes the guesswork out of doing this. The plants will only take up what they need, depending upon how much moisture they transpire through their leaves. We use trays at the nursery, which are filled through the shade netting when it rains. Shallow trays avoid the danger of the pots sitting in too much water. As long as the crowns of the plants are well clear of the water level, this will work wonderfully. Many gardeners swear by container growing to help prevent pest damage. However, you must remember that although snails prefer decomposing, smelly vegetation they are are lazy feeders, so will eat your hosta leaves if that is the only food source to hand. H. 'Shimmy Shake' at Gardeners' World Live 2011. 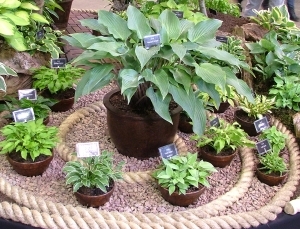 The pot displayed the habit of the plant to great effect. To avoid this, stand your pots in shallow dishes or trays and keep them topped up with water - snails cannot cross water as they need air to breathe. Snails will climb anything so try to avoid placing your pots up against walls & fencing and under overhanging shrubbery. At the base of the pots, in the coolest shade place a small jar on its side with a teaspoon of slug pellets in it. This will attract any snails wandering around your pots in for a feed. Using the jar is essential to keep the pellets dry and the active ingredient sufficiently pungent to attract the snails - more details here. 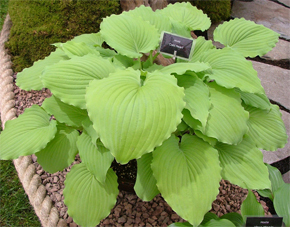 H. 'Yellow River' at Gardeners' World Live 2010. This variety would have needed re-potting in a much larger pot at the end of that particular season. Some larger varieties will only appreciate being pot-grown whilst their root systems are immature, unless you have the kind of enormous urn seen gracing the grounds of some our stately homes. If it appears your plant is no longer growing, and it hasn't yet reached it's mature dimensions, it is probably pot-bound. Some of our giant varieties will only produce a handful of leaves in a 15-20 litre pot because the root system is so large. 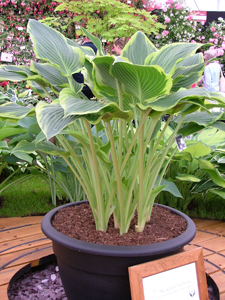 If your hosta produces flower spikes too early, especially without surrounding foliage, this is an indication it may be pot-bound. Chop off the flowers and re-pot or divide the plant - more details here. If you do need to re-pot a particularly pot-bound plant then we suggest turning the pot onto it's side and hosing out the contents. This will not damage the plant - indeed it will help the removal of the soil and enable you to see how best to divide the plant. It also mitigates the risk of a hernia, and any damage to the pot. Some older varieties do seem to prefer being ground grown, especially if they are slow growers such as those from the H .'Tokudama' branch of the genus. But even these will do well in a pot. If any of our ideas inspire you, don't forget you can select specific plants using our 'search resource'. Simply click on the dominant leaf colouring you desire and those varieties with that leaf colouring are listed in order of size, with an indication of the flower colour too. 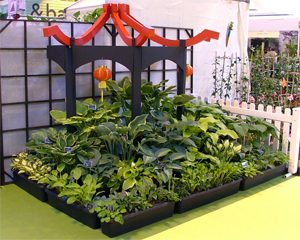 Container growing can be very useful if you are experimenting with layouts and exploring the benefits of different locations within your garden. 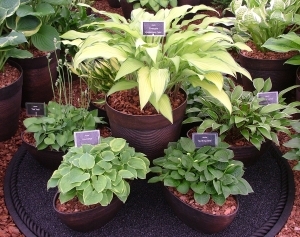 If you are unsure of how a plant will look in a specific location then use a pot of the first year or two before committing the plant to the ground. Some varieties would benefit from being container grown for a couple of years before planting out if their root systems are more fragile. It will help them to bulk up before they have to argue with more established plants for nutrients and water, etc. Using containers can help get plants established whilst you improve the growing conditions in your garden, if the ground is improverished, compacted or has suffered flooding, etc. 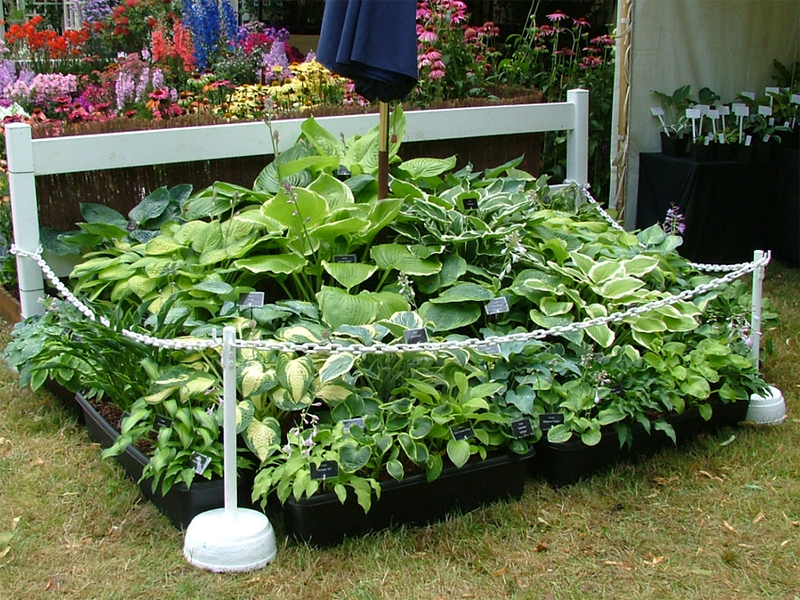 Containers are very useful to help raise your plants higher in the garden, in much the same way as a raised bed. With all the flooding problems across the UK this year, many gardeners are looking to find ways to mitigate future losses of precious plants, and this is a good way to do this. Indeed the Gardeners' Question Team panel recently advocated the use of raised beds for growing just about anything when they began receiving lots of queries about how to avoid the damage caused by excessively wet conditions. Raised beds can be a lot of work, especially if you are only looking to 'grow on' your plants - how about using an old ladder? The image opposite shows miniature varieties on a couple of step ladders, which looked lovely at Harrogate Spring in 2016. 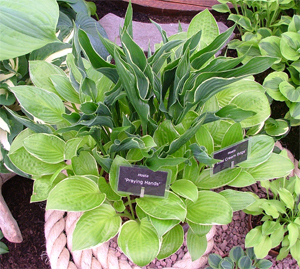 We used this combination at Gardeners' World Live, Tatton Park and Harrogate Autumn 2012. 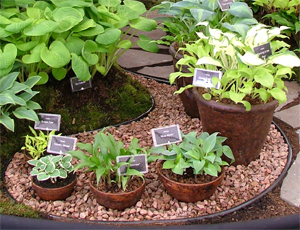 We planted this pot at the start of the 2012 season and used it at the Harrogate and Malvern Spring shows. 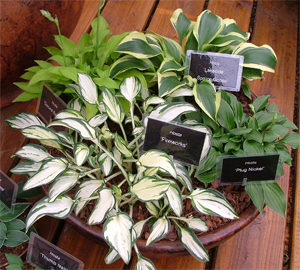 The bowl of miniature varieties, in the image below, can be a good place to start such varieties off. Some of the miniatures are so small they would simply get lost planted in the ground and some of them have such fragile root systems they need a grittier medium in which to grow. Good root to soil contact is particularly important for such plants to enable transfer of moisture and nutrients. Many of our customers were inspired to do something similar with their miniatures and place them on garden tables as arrangements. This is also a good idea as they would benefit for the shade of an umbrella and are less likely to suffer snail damage being placed up off the ground. It is perhaps more important you do not over, or under, water miniatures, so stand your planted bowl in a shallow saucer topped up with water. One customer asked us for recommendations of miniature varieties to edge a 6" deep gulley around the base of a newly constructed conservatory. Edging the base of a building with plants is a lovely idea but the soil beside a building can be a tough environment for any plant to flourish in. This is why you see so many tougher, often evergreen, shrubs used for this purpose. Our recommendation was to use small varieties rather than miniatures and to plant these in narrow troughs. This would give more soil space for the plants to grow into and allow the plants to be raised above the level of the paving. This would also allow the customer to place those all important little jars every so often, underneath, or at the back of, the troughs to prevent pest damage. Plastic containers are good to use because they are not so heavy to move around. 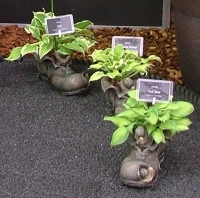 In our displays we tend to use terracotta pots, which we paint to create different effects. 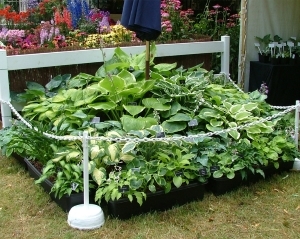 Troughs are also good if you wish to edge an area, particularly if there is a lack of soil to plant into, for example, around a conservatory or greenhouse. During 2013 and 2014 we experimented with displays, which incorporated natural planting with occasional containers placed to enhance the overall designs. These displays have succeeded in highlighting the plants we used in the containers to such an effect that often the very same varieties used in the naturally planted borders were completely overlooked. Two very good examples of this were H. 'Deanes Dream', above right in the centre of the rope spiral, which caught everyones attention in the pot but none in an earlier display, where it had been part of a border. The other is H. 'Cold Heart' - opposite, which we have exhibited several times. The first time was at Malvern Spring in 2011, as part of the inner border of the pathway through the stand, where it has to compete with other, more colourful planting and I even neglected to include it in my photographs. When we popped it into a container for the Malvern Spring show in 2013 it stole all the attention, and we sold out during the first morning of the show. That was a good lesson in plant placement. Some varieties look better in a mixed border, whilst some in pots and this is largely down to experimentation. 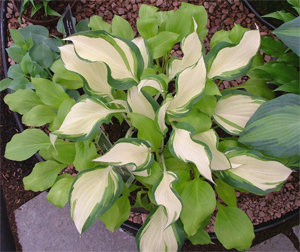 Don't ever consider that a hosta, once planted, must stay where it is. If you feel it would better exhibit its qualities in a different spot then move it, or pop it in a pot and see where it does best - this is the beauty of container-based gardening. The importance of the space around a plant. As any artist will confirm, the space around a subject can be as important as the subject itself. Using this idea we have refined our container displays to add form and texture to the spaces the containers occupy. In 2015 and 2016 we used circular discs to isolate containers as a feature. We have made use of shallow, oval pots, round a central container to form a stylised flower shape. Using miniature and small varieties in these petal pots creates a layered effect. The deck is edged with black rope and black aquarium gravel gives texture to the surface. The black rope and gravel serve the purpose of isolating the group whilst drawing the eye to the circular, flower-shape design. Petal pots underneath a central plant at Hampton Court 2015. This group would appear more distinct at ground level rather than elevated on a display platform. If you did something similar in your garden, recycled tyre chips would probably be a better bet than aquarium gravel as a textured surface. 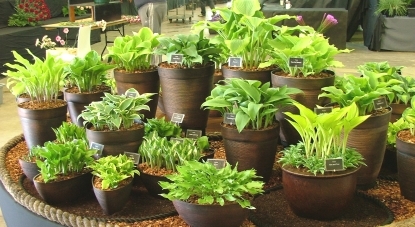 A great way to display containers is to select similar shapes in different heights, or simply all the same shade. The display opposite does both, the containers are all the same colour but vary in height and shape. You don't have to splash the cash either, these are not copper pots but plastic. If you have a mish-mash of pots in your garden shed, you could opt to paint them to create a similar look.